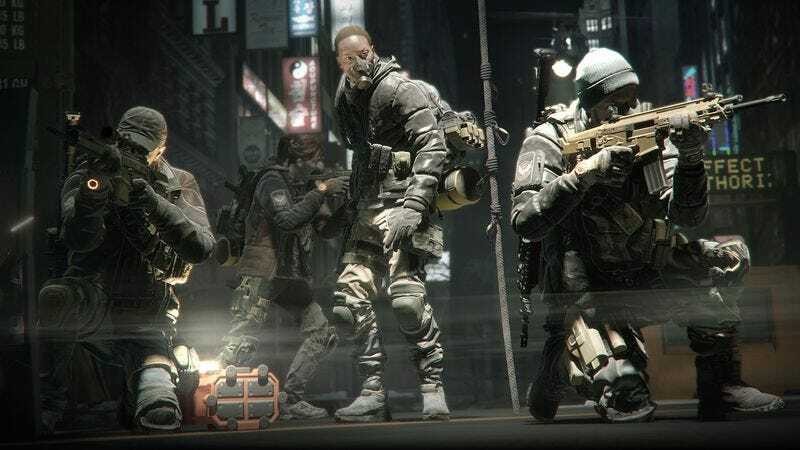 Since it came out last week, I’ve been hard at work in Ubisoft’s new online shooter Tom Clancy’s The Division, making my way through its sometimes fascinating, often-frustrating world of cover-based shooting and jumping jack-loving government agents. And while I’m not quite ready to write up a comprehensive review—look for that next week—I do have some valuable lessons gleaned from my time in the game’s snowy, sterile New York. The Division’s New York might want to consider changing its nickname to The City That Never Sleeps—Because People Are Busy Hoarding Weapon Modifications On Their Person And Shoving High-Powered Kneepads Into Chests (or maybe just The Big Toolbox Full Of Guns). As a member of The Division, it’s both your duty and your right to hoover up that sweet loot in an ongoing quest for numbers that are bigger than the ones on the stuff you already have. Dropped goodies are shared between party members, so don’t be shy about grabbing a new pair of chinos off a bandit’s corpse; the well-appointed government agent never goes anywhere without at least 10 different blood-splattered parkas crammed into their armor-plated backpack, one for every possible social event. There’s nothing like getting ripped apart by one of the game’s many supermen (more on those in a minute), looking around for a teammate to revive you, and realizing one of your party members is off in a cranny hunting for treasure like Lara Goddamned Croft. The Division sometimes hides some good stuff off the beaten path, but the merits of playing hide-and-go-swag are offset by the fact that it hides equally good stuff in plain sight, around every corner, and on the thousands of loot piñatas you spend the majority of the game mowing down. I promise: The shotgun-toting thug who just blasted a hole in your teammate’s torso is carrying a pistol that’s just as nice (or better) than the one you spent 20 minutes crawling through airvents to snag from a hidden chest. It’s an old adage: That which doesn’t kill you gives you the ability to withstand 20 sniper-rifle rounds to the head. For a game set in a potential mid-apocalypse, The Division is pretty low-key about its science-fiction elements. Its villains are all regular human beings and survivors—in theory. “Armor” or no, by the time you’ve spent a solid minute unloading an assault rifle into a gold-level bad guy’s face, it’s a lot easier to buy into the idea that The Green Poison—the biological MacGuffin that’s transformed New York into a body-strewn ghost town—must also confer magical powers on its survivors. On the plus side, this also makes it a lot easier to write off the small town’s worth of people you’ll end up laying waste to as they emerge, clown-car-like, from apartment windows and around city corners. They’re not people; just virus-modified monsters. Virus-modified monsters full of loot. 4. If you shoot the dogs, they’ll die. So don’t. Combining a spooky name and an intimidating premise—i.e., that you can actually interact with and potentially battle your fellow players—The Dark Zone at the center of The Division’s New York is a scary place. It’s also one of the game’s best features, so don’t be afraid to get your hands dirty and plunge into the chaos: Form teams, scour the Zone, and cooperate with your fellow humans for your combined benefit, bound by shared mutual interest and the brotherhood of man. Now that all the idealists have run off to get torn apart by their “friends,” let’s get real. The Dark Zone is just like the rest of human nature: bloody, violent, and inherently treacherous. Firing the flare gun to call in an extracting for your hard-earned gear is the equivalent of painting a target on your back for every opportunist and rogue agent in a mile radius, and after the third time your supposed allies turn on you six seconds before the chopper arrives to collect your stuff, you’re going to learn some hard lessons. Kill or be killed; smile with a gun in your hand and a finger on the trigger. Betray or be betrayed. And, as in all things, never forget the wisdom of Mr. Randy Newman: It’s a jungle out there.